Packing for Two Climates in Nothing But Carry-Ons? Nailed It! Spring break is upon us, and we’re headed to Hawaii. A swimsuit, a towel, some sandals, and sunscreen — packing should be simple, right? Or not. We’ll definitely spend plenty of time on the beaches, but we’re also taking our soon-to-be-13 year old nephew to Hawaii Volcanoes National Park, where it can get downright chilly in the upper elevations. So, we found ourselves once again packing for multiple climates (see also: Australia in winter!) while limiting ourselves to nothing but carry-ons! Impossible, you say? We were tempted to agree after we piled up everything on our packing list. Uh-oh. This is NEVER gonna fit. 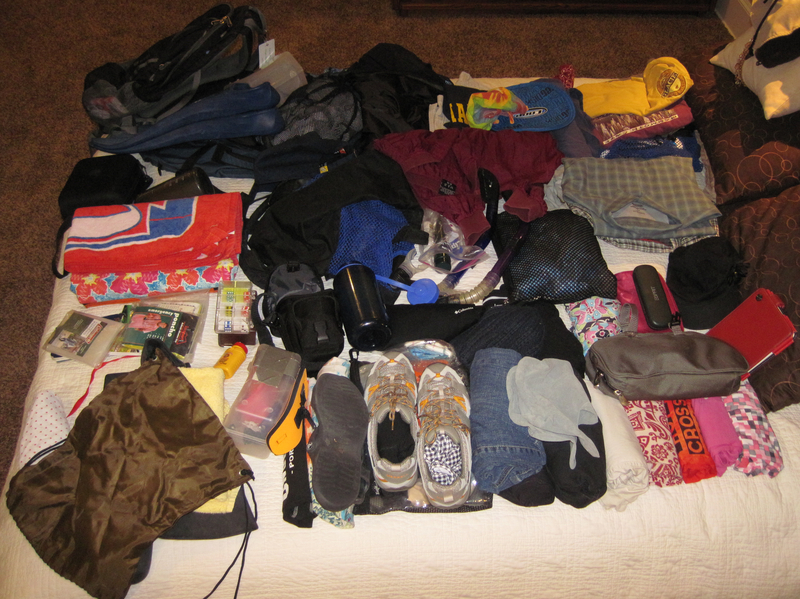 But we channeled our inner Rick Steves (who says “you’ll never meet a traveler who, after five trips, brags: ‘every year I pack heavier'”) and eliminated duplicate items, purged a few more, rolled up our clothes … and everything fit! Having trouble eliminating “essential” items from your packing list? Not sure what to purge? Get perspective into our planning, purging, and packing process that’s been 25 years in the making. Packing light can help you have a great week or a weekend! Have any favorite packing tips of your own? A few years back I purged my everyday wardrobe after participating in Project 333 (a minimalist clothing experiment). I learned then that we really don’t need that much stuff. Because no one really cares that much what we’re wearing. Having fewer items that all work together is really freeing. I’d rather spend my time on a trip contemplating what we’re going to do than what I’m going to wear–and if you don’t have much, there aren’t many decisions to make! Hope you guys have a wonderful time. Drink a mai tai for me! May I make a suggestion? Snorkel Bob’s rents fins, masks, etc. for incredibly cheap prices. They rent by the week, so pick up on the way in, drop off on the way out. They are only a couple of miles from Kona airport. I’ve found that my best clothing items in Hawaii are a fleece and a light rain jacket. A pair of travel pants that roll up into capris, good hiking shoes, all set! Great tip! We carry Snorkel Bob’s no-fog goop everywhere we snorkel! We have custom prescription masks. As for fins, we’ve tried renting with mixed results. Apparently we’re snorkel snobs! 😉 Fleece and rain jacket are packed; travel pants and hiking shoes will be worn on the plane! Have a great week or a weekend! Well done. I think once you can get past the fact that no one cares what you are wearing except you, carrying just carry on is easy! I’ve developed my own packing lists over the years – they started off looking like Ricks but over the years I’ve modified them to suit me and my style better. 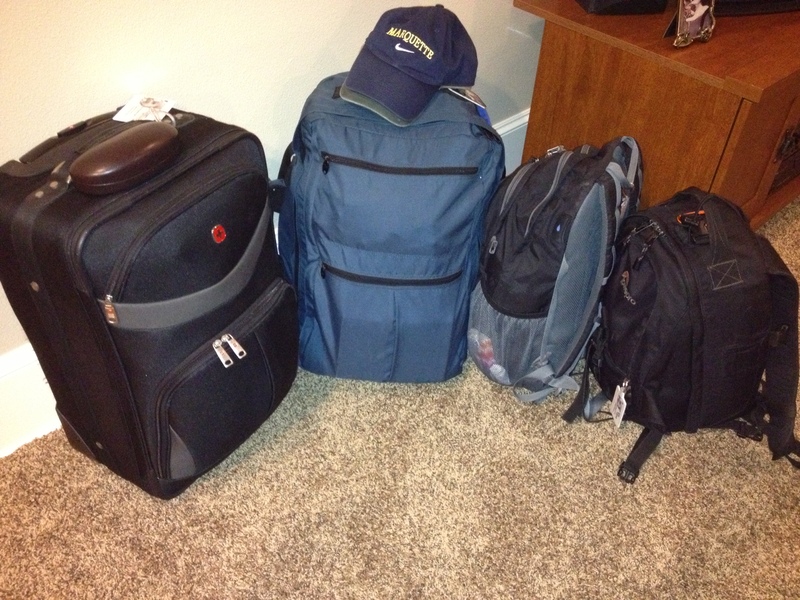 Now I can almost pack for a month long trop to Europe in my sleep – it just takes self discipline and practice! Thanks for stopping by our blog and leaving us a comment. We’ve modified our packing lists from Rick’s as well, but his were sure a great starting point. Seems like we have an easier time packing for a long trip now than we do for a weekend to the beach! Enjoy your week or your weekend.